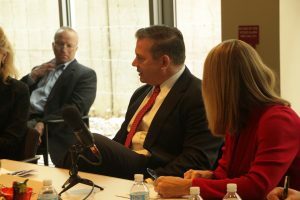 Executive Leaders Radio conducts "elite interviews" of prominent CEOs, CFOs, and Presidents focusing on "what makes people tick." The ten to twenty-five minute on-air interviews are really informal POSITIVE conversations. 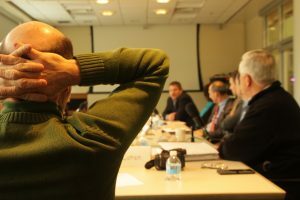 Guests may be asked about their background education, influences, mentors and early career experiences, asked about their business, what they do and who they serve. They may be asked about opportunities ahead, challenges they have faced or their senior management team. Interests outside of work, personal turning points and family sacrifices capture the unique human aspect behind these prominent leaders. Ethan Millrood comes from a family of 7 children. With a strong desire and need to become independent – at age 13, he got a job at Santino’s Pizzarama in Devon, Pa. He put his heart and soul into making pizza boxes, working the grill, cleaning the toilets, washing dishes and learning every single aspect of the business. Exactly the same as what Ethan does today for his clients as partner of Go2Tech! 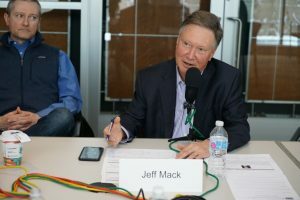 Jeff Mack was born in Philadelphia, grew up in Allentown, PA .He is the oldest of three. At the age of 15, while at boarding school, his parents divorced. As the oldest child, he assumed the role of holding the family together, which is what his role became as co-founder of Smith Mack & Company, the largest organically grown commercial real estate firm in the Philadelphia region. Smith Mack was sold in 2012 to Newmark Knight Frank (NASDAQ) where Jeff is a leading commercial real estate broker. Phil Jaurigue’s parents immigrated from the Philippines and were both surgeons – as oldest of 3 boys it brought a lot of pressure which he took on - he founded Sabre Systems, won the PBJ 100 8x in a row and brings security technology he’s developed for the government to commercial clients. Mary Pat Kessler grew up in Washington DC. She is the oldest girl of all 10 siblings. When she was 15 years of age her mother passed away, leaving her in the role of caretaker to her 9 siblings. As Director of Sales and Mktg for Sabre Systems, she manages , problem solves and selflessly cares for her team and clients - exactly what she does with her family!! Radio America: Radio America is a national network of radio stations airing quality talk radio programs. WCHE 1520AM: WCHE 1520AM is a commercial radio station located in West Chester, Pennsylvania, broadcasting to the western suburbs of the Philadelphia, PA area on 1520 AM. WCHE broadcasts and streams over the internet a variety of talk shows, and a mix of hits from the 1950s and 1960s. Mark Haas grew up in Akron, Ohio. He started earning money as a caddy at age 12, while delivering newspapers and doing yardwork for neighbors, which created a network of cross-referrals. He always saw the big picture and connections, which is why he now runs a boutique strategy and performance advisory firm for midmarket businesses and nonprofits. He is also Co-Founder and Board Chair of the Association for Enterprise Growth (AEG), an ecosystem of seasoned advisors in complementary disciplines. 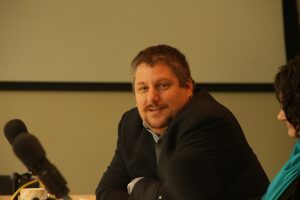 He created AEG to fix a critical problem with specialized professional advisory services by integrating advice to address an owner's personal, business and monetization needs throughout the company lifecycle. John Yetman grew up in Bowie, Maryland. He has been an entrepreneur from an early age selling firewood, cleaning gutters, making and selling doughnuts. At age 7 he and a friend ran the first “curbside, drive-through garage sale” in the city – which was chronicled with a picture and writeup in Bowie Blade newspaper. Today John is a Wealth Manager and Co-Founder of The Association for Enterprise Growth (AEG). The AEG helps business owners grow their business, create value, align their business and personal goals and transfer or sell the business on the owners terms. 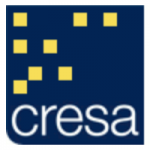 Rich Rhodes is Partner with Cresa, a Tenant-Representation Real Estate firm. They don’t have the conflict of the typical real estate broker who is trying to take commissions from both the landlord and the tenant. Joe Applebaum, at the age of 12, Joe started his window washing business which he ran to the age of 23 and was earning more than many of his friend’s parents. Joe is the original partner who brought this show to Northern Virginia, which is now the leading business radio show on the East Coast...Joe’s day job is CEO of Potomac Companies, which helps employers control the future cost of healthcare. Brian Chandler grew up in Pittsburgh with 2 brothers and 1 sister, and even though he was the 2nd oldest he took the “older child” role, maturing faster than his older brother. Brian was known amongst his siblings as “the achiever.” At 12 he was a Caddy, trying to “provide good service and anticipate what they wanted.” At 16 Brian got a job at a lumberyard as a fork lift driver, however he was always anticipating - as an soon as he’d finished packaging the orders for the contractors he go back to the retail store to fill the nail bins or bring the drywall inside. Same as Brian does as CoFounder and Member at Protorae Law, anticipating his client’s needs. WFED 1500AM: Federal News Radio is heard throughout the Greater Metropolitan Washington Area at 1500 AM and in Frederick, Maryland at 820 AM. Potential audience is more than 4 million. WFED/WWFD has more than 80,000 listeners. Thanks for the follow up, the show was great fun, not at all what I expected!! Herb is a maestro, and really made it flow. A great experience, well organized, and much more fun than anyone ever imagined. Not to mention the great people I met there, who I hope will become friends. I think it went well. Herb is a pro! The team made me feel very comfortable. Thank you VERY much for this tremendous oppty!! The show was fun and easy to do. I had a most enjoyable experience that I will remember with fondness and pleasure. Herb is a gracious and accommodating host who made the event flow as if it was an everyday experience for me. I listened to the show this morning and enjoyed hearing myself on the radio being interviewed by Herb and his Guest Host, it is one of those events that a makes a person smile with pride. ‎"Thank you for inviting me to be a part of this radio show. I wholeheartedly believe everything happens for a reason, and it seems to me, meeting you all has already made my world a better place. I wasn't so sure about how this all would go, but after listening to you all, and the other guests, I get it.. we all have a story, and we all connect to pieces of eachother.. if only all people could feel connected, find the similarities, the common bonds, and value of that connectivity.. maybe the hate would fade, strangers could smile, and this world could start to heal! ‎"